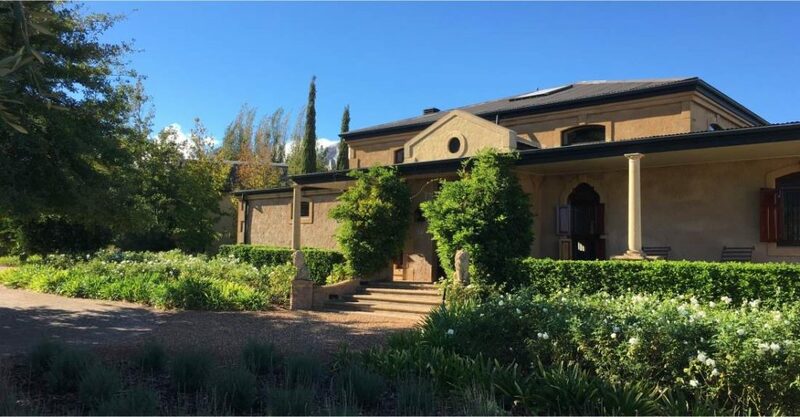 Domaine des Anges is an up-market residential community and was one of the first security estates to be established in Franschhoek. It was developed by Jack Clark, working with Board of Executors, an investor group led by Phil Biden. The gardens and clubhouse were built in the year 2000, and the last house was completed in 2009. From the very beginning the agricultural character of the gardens was considered to be an important distinguishing quality of the development. The olive trees that help to create the timeless quality of the estate were obtained from La Estancia Farm in Paarl and were already mature when they were originally planted. Important features of the farm that originally stood on the site were preserved and form the centre of the estate, including the 100-year old oak trees and the farmhouse (now House Number 1). The guest house that originally occupied House Number 2 was eventually re-established up the hill to the east of the estate and is still known today as La Residence. The French Provençal design theme relates to the Huguenot settlers who first inhabited the Franschhoek valley and to the climatic similarities our region shares with the Mediterranean. The plants that were selected for the gardens, including lavender, citrus trees, and star jasmine, are common in Provence, grow successfully in our micro-climate, and require minimal water. The 12 hectare estate is bounded on the east by agricultural land and enjoys 360 degree panoramic views of the mountains. The centre of Franschhoek village can be reached on foot in 10 to 15 minutes, and the walking route features some of the most striking views in the village. Domaine des Anges is home to 38 households, and its diverse community includes year-round resident owners, families with children, and couples with second homes in Europe. The limited number of residents, the walking paths that criss-cross the gardens, and the community facilities have all helped to create the sense of community spirit that we all enjoy here. The clubhouse, which contains space for snooker, card games, social events, meetings, a sauna and a well-equipped fitness centre. It is available for use by home owners as well as for private events hosted by residents. Additional amenities include a floodlit tennis court, an outdoor swimming pool, and a boules terrain. The philosophy that has guided the architecture of the estate is based on individuality and harmony. Each homeowner was free to create his/her own individual statement within the Provençal French theme, choosing from a palette of acceptable colours and working within well-defined design guidelines. These guidelines are still in effect today and apply to any upgrades or modifications undertaken by home owners. Since all of the plots were built out long ago, there is no disturbance from construction activity. However, given that the estate is now over 15 years old, many homes have recently been or are in the process of being updated and refurbished. The tasks of reviewing plans for any new works, as well as planning for improvements to common areas, are controlled by the Aesthetics Committee. The estate is run by a properly constituted home owners association. The average plot, owned in freehold title, is 900 square meters. Day-to-day management and maintenance of the estate are ensured by a full-time Estate Manager and 8 full-time staff, with oversight by the Trustees’ Committee. In 2016 a new security system was installed using thermal imaging technology. The system is largely invisible, allowing the romantic character of the rustic enclosure wall to predominate. Domaine des Anges is a working farm. Each year 200 to 400 litres of olive oil and about 1000 litres of wine are produced by the estate and made available to residents. Fruit-bearing trees include lemons and pears, as well as oranges, which are donated annually to charity. Borehole water, which is used for the estate gardens as well as by homeowners, is stored in two ponds that serve as landscape features and as a wildlife refuge. Provençal French theme, choosing from a palette of acceptable colours and working within well-defined design guidelines. These guidelines are still in effect today and apply to any upgrades or modifications undertaken by home owners.